I love whodunits. I love mysteries. 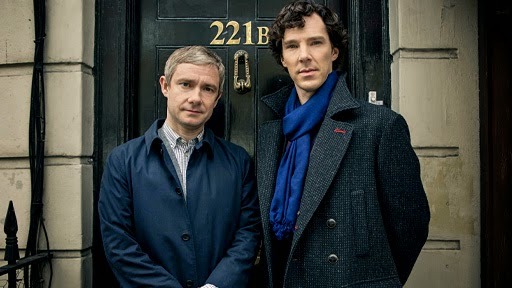 More than that I love competent characters who can solve mysteries using deduction and reason without a lot of the dribble that pollutes modern day television shows. Those are the purest of mystery solvers, I think. That's why shows like C.S.I. just kinda leave me feeling pretty meh these days. Now that Grissom is gone, one of the few genuinely interesting characters created by the franchise, I don't see an appeal to the show anymore. The Mentalist is probably the only other show on television that I think I can enjoy when it comes to solving mysteries. Simon Baker's character is legitimately interesting. Sherlock, though. That's the granddaddy of them all. Well, for the most part. If I am anything like most people that like Sherlock Holmes (and it is indeed a rarity that I am like most people) then I'd like to argue for a general consensus that most people who do like Holmes have never touched a single work by Sir Arthur Conan Doyle. I think everyone is the same way when it comes to James Bond or Jason Bourne, too. You know the characters, but I would like a show of hands as to just many of you have actually read any of the source material. If you have then I'd love some recs. Much like Dracula as well, the character of Sherlock Holmes has become far more attached to the actors who have portrayed the intelligent sleuth on screen. Perhaps the most famous portrayal belonging to that of the brilliant South African-born English actor Basil Rathbone. Of course, Peter Cushing, Christopher Lee, Jeremy Brett, and even Robert Downey Jr. have all had their stay in 221B Baker Street, too. I suppose everyone has their favorites, but for me it would be Mr. Rathbone. I was very impressed by Benedict Cumberbatch when I saw him in Star Trek Into Darkness. Having never heard of him before, I was taken quite unawares. After that I decided to look up some of his previous work to wonder just how I'd miss someone like him. I discover through my search that he had portrayed Sherlock Holmes in Sherlock. I was definitely intrigued, but also a little bit put off. I'm not a big fan of the show Elementary and I've already seen the almost-Sherlock character of Gregory House do his House thing so many times it isn't even funny. To me, House felt more like Holmes than that guy in Elementary. I'm just really tired of seeing diluted Sherlocks. I just wasn't in a mood for yet another take of the man with the drug addiction and penchant for solving complex crimes. Or so I thought. What did convince me was Benedict Cumberbatch. I mean, the guy has presence. A cool name, too. I thought that the role of Sherlock Holmes would have been made for him just as much as the role of Khan. The temptation to watch a modern day Sherlock played by a modern day Khan was just too great and I was rewarded for my curiosity. Martin Freeman's role as a surprisingly competent Watson was also rewarding. Much better than Lucy Liu's female Watson or the often cringe-inducing performances in later films by Nigel Bruce. The only thing I was a bit hesitant about as I started watching was the modern day setting, but the transition was not all that jarring after a couple of minutes. Watson being a blogger and Holmes being a texting addict doesn't seem that out of sorts. Outside of solving crimes, they are largely shut-ins. It kind of makes sense. But the technology doesn't provide a crutch for Sherlock because he is by far the genius he is supposed to be. The technology only seems to be there to confirm something he already knows or to provide an extra layer to a mystery. It's also used to tremendous effect in the episode regarding Irene Adler's phone. Perhaps the most bizarre update presented in this nine episode series (as of this writing) is that of The Hound of the Baskervilles. That story was my first introduction to onscreen Sherlock when I was a kid and I have seen both the Hammer and 20th Century Fox versions of the story many times. So the idea that the infamous hound was the result of genetic mutation at the secret base Baskervilles was a bit odd, but it was quite interesting. I don't recall Christopher being haunted by that particular monstrosity, but the episode as written was very clever and won me over. Of course, the true test was Moriarty. While at first I wasn't entirely convinced of Andrew Scott's performance as the infamous nemesis, I really began to appreciate him in the finale of the second season. This series started in 2010 and still only has nine episodes. Each of those episodes are an hour and a half so it is really like seeing nine movies, but the cliffhangers at the end of each season are killer. Season four looks like it will come out in early 2016. That's an agonizing wait. Highly, highly recommended, though. Wait be damned. I've got to see this. There are a few people on the SKMB that love this show too. I've had this on my radar for a while. I guess it's time. I would have thought you would have seen this already. It's definitely worth seeing.